Note: This post in primarily directed towards hypotheticals problems, as opposed to essay questions. A guide to writing exam essays can be accessed here; a general guide to managing law exams can be accessed here. After six years of high school, (at least) three years of tertiary education and the all important LSAT(s), chances are you’re familiar with the importance of doing practice problems. It should come as no surprise than that one of the keys to success at law school is doing… you guessed it, practice problems. Have a platform for seeking feedback from your lecturer. But is it as simple as sitting down, grabbing a pen and tackling 2015’s Obligations exam? That’s precisely the question this guide aims to answer. 1. When should I be doing practice problems? Ideally, you will already be familiar with the practice problems in your subject Reading Guides. You may have been asked to prepare a written response for these, or you may have simply discussed them at a general level in class. Either way, the answer to when you should be doing practice questions independently is as soon as possible. To find old exams, look on the LMS. For older exams, you can also check out the exam repository. But what if I don’t feel confident about the subject materials? A major reason why a lot of students put off practice questions is because they want to feel in command of the subject materials before they sit down to test their knowledge – but this approach is misguided. Whilst you probably won’t benefit from doing practice questions on topics you’ve completely neglected, as long as you have some foundation of knowledge on the subject, it’s beneficial to look at practice questions early on in your revision. This is because practice tests stimulate revision by pointing out the deficiencies in your understanding, whilst also giving you insight into the intersections between different parts of the course. It might also give you guidance on how you can structure (or re-structure) your exam notes. This approach might mean only doing the bits of the practice problem you understand and then making a note to return to the rest after you’ve revised the other topics. It might equally mean writing a series of questions to follow up with your lecturer in class or in an appointment. Either way, don’t put off practice just because you don’t feel prepared. Law School, especially first year, is all about getting thrown in the deep end, and if you’re waiting to feel 100% prepared before you start to swim, you might leave it too late. At least after a practice problem you’ll have a better idea of what to improve. 2. Should I do them by myself or with other people? Ideally, you should physically meet up with a small group of fellow students, and write out practice exams together, in full (learn more about independent study groups here). This will more closely simulate the environment on exam day and make formalities (like timing the exam and not using your phone or laptop) easier to enforce. Doing practice exams this way will also give you an opportunity to discuss the materials at a deep level after having completed them. Sharing the way you conceptualise and apply legal principles with others is an invaluable learning experience because it forces you to articulate and justify your understanding. It may also help you identify inconsistencies or deficiencies in your knowledge that you might not come across studying alone. 3. Should I time them? Eventually, yes. For each of your subjects, you should have done a full exam under strict time conditions. But that doesn’t mean you can’t extend the time in your first few practice problems so you can still write your answer out in full – getting used to the time restrictions isn’t as important as getting used to applying your knowledge! 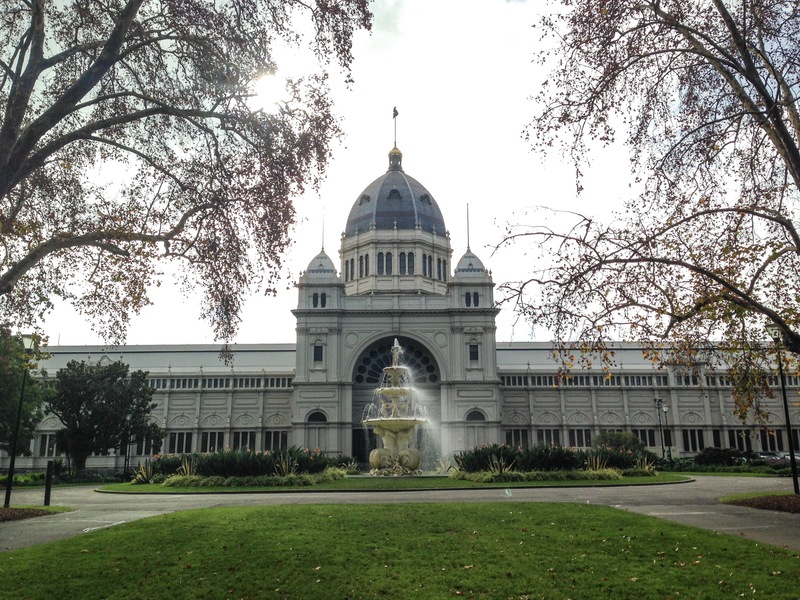 The Royal Exhibition Building – where most of you will do your exams! 4. But they’re hard, and scary and I hate them? It’s unlikely that any law student feels 100% comfortable with their first (or second, or third) practice problem. The sheer volume of content that is covered in the average law subject, and the comparatively short amount of time provided to develop a concise, precise and analytically rigorous response in fact ensures the opposite in most cases. The key, however, is to approach law school exams with the right strategy. That means keeping up with your readings and classes (see here for more on that), consistent and purposive revision (see here for more on that), producing a functional set of exam notes (see here for more on that) and showing up on the day. It’s also important to dump the negatives. Law school is intellectually laborious and at times extremely stressful. Doing practice exams is part of that process, and it is highly likely that you will receive critical feedback from your lecturers or your peers on your responses. It’s important to embrace that feedback as an exercise in making you a better student – rather than an exercise in pointing our flaws in your knowledge. Still stuck? The LASC is running a workshop ‘Exam Prep for First Year Students’ on 16 May. Register here to be on the waiting list. Susan A Ambrose (ed), How Learning Works: Seven Research-Based Principles for Smart Teaching (Jossey-Bass, 1st ed, 2010) 136. Michael Hunter Schwartz, Expert Learning for Law Students (Carolina Academic Press, 2nd ed, 2008) 241.